This jewel-bright accompaniment looks stunning on the table and tastes divine. 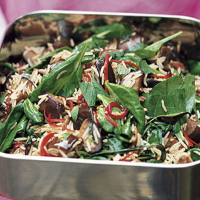 The slightly sour flavour of the tamarind works wonderfully with the aubergine and spinach. It's simple to make, using Waitrose Microwave Basmati Rice, for perfect results. In a large frying pan or wok, warm the oil over a medium heat. Add the onion and cook for 10 minutes or until brown. Increase the heat and add the cubed aubergine, half of the sliced chilli, a tablespoon of tamarind and the muscovado sugar. Stir-fry for 5 minutes until the aubergine is golden and beginning to soften. Remove from the heat. Meanwhile, cook the rice according to the instructions on the pack. Then add the rice, chopped mint, spinach and the remaining tamarind to the aubergine and onion mixture. Toss all of the ingredients together until the spinach begins to wilt. Scatter the remaining chilli slices over the top of the dish and serve immediately. For best results, cook to the end of paragraph 2 of the instructions before cooling and transporting to the party in an airtight container. Continue from paragraph 3 when needed.